A cultural and stylistic landmark event, Breakfast At Tiffany's is a timeless classic, capturing an America just moving into a decade of enormous change, and doing it with panache. When Holly Golightly is depressed, she eats breakfast while looking through the windows of the Tiffany's jewellery store in New York. Living with her cat (named Cat) but otherwise very alone in her apartment, Holly's life is a series of encounters with men who seek her company and pay her well for it. She classifies them as rats or super-rats, depending on how loathsome they are. Holly is desperately seeking happiness, fulfilment and riches; but she is unwilling to surrender her heart or her life to any true relationship. She even stoops to the level of getting paid to visit a locked-up crime boss in jail, oblivious that she is being used to transmit his commands. Struggling author Paul Varjak (George Peppard) moves into another apartment in the same building. Women find him attractive, particularly Mrs. Failenson (Patricia Neal), a decorator who is willing to pay Paul for his calculated affection. Holly wants to keep Paul strictly as a friend, and does her best to try and deny the growing deep connection between them. Holly's former husband Doc (Buddy Ebsen) shows up in New York pleading with her to return to her origins in Texas, but Holly prefers a life of independent struggle in New York to retreating to the comfort of anonymity. Eventually, Holly reaches a critical decision point: her prospects look grim, unless she lowers the fence around her heart. The sub-text of Breakfast At Tiffany's is as fascinating as it was likely unintended. Holly Golightly is an unwitting icon for women rocketing from the predictability of the1950s into what would become the turbulence of the 1960s. Finding love, forging an identity, making new connections in a brave new, exciting and freedom-obsessed world while being pressured to revert to the old, safe environment are issues that Holly struggles with in a pioneering role: a whole generation of women was about to follow. 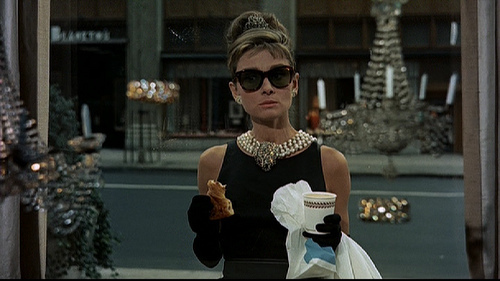 That Holly grapples with the big decisions in life so stylishly is a big part of Breakfast At Tiffany's appeal. The ridiculously oversized cigarette holder; the Givenchy dresses; the hats; the sunglasses; the jewellery: rarely has a single film had such an indelible impact on fashion, and Breakfast At Tiffany's is considered one of Hollywood's most elegantly stylish and trend-setting moments. Unintentionally, it probably also launched the modern era of wanting the luxury without being able to afford it. Holly never has any money, and she nevertheless looks gloriously fashionable wondering where the next dollar is going to come from. Working from the novella by Truman Capote and a script by George Axelrod, director Blake Edwards assembles all the pieces of Breakfast At Tiffany's into a dazzling whole. He augments the visual appeal of his stars and setting with Henri Mancini's music, the spine-tingling theme song Moon River instantly taking it's place among the classic tunes of Hollywood. Edwards elegantly inserts the song throughout the movie without overexposing it. The trademark Edwards humour is well on display, the party scene in Holly's apartment a preview of what would become The Party in 1968. Despite the occasional upward blips in the 1970s and 1980s, Breakfast At Tiffany's was the apex of Edwards' long career, which unfortunately descended too quickly into too many cheap journeys to Pink Panther land. Audrey Hepburn admitted that the role of Holly Golightly was difficult for her. She pulled it off magnificently, deliciously combining innocence with a hard edged determination to get her way and keep her heart cold. And Hepburn never looks less than ravishing in every frame, establishing her legendary reputation for timeless grace and beauty. 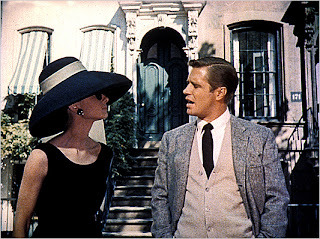 George Peppard is adequate as Paul, never catching fire but holding his own opposite Hepburn's brilliant shimmer. Mickey Rooney's portrayal of Mr. Yunioshi, Holly's upstairs neighbour, has been soundly criticized over the years for amplifying stereotypes about Chinese people, with a white man portraying a humourless Chinaman just making matters worse. Edwards' movies in the 1960s and 1970s never avoided walking the dangerous tightrope between funny and inappropriate racial-based humour, and if Breakfast At Tiffany's today falls on the wrong side of the divide, it is another reminder that the film is a most grand bridge that spans two very different eras of social enlightenment.